Just a little bit after 5pm here at Southern National. Late models are finishing up tech, lining up on pit road, should be underway around 5:10pm. 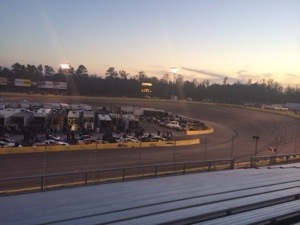 So the sun is finally setting over turn one, thermometer is showing a solid 46 degrees. Dad and I have got are cold gear on and the heater ready to go! All of the supporting divisions have qualified. Spencer Saunders and Shawn Balluzzo ended up taking the third spot in their respective division. Not to mention strong runs from Matt Morgan and Connor Hall! Legends race to follow the Late Model heat races. So if you have never been to Southern National Motorsports Park first things first you need to plan a trip! Second, for the supporting divisions, the track uses a euro style qualifying. They let 5-6 cars on the track at one time, you get 5 laps to turn your best time. It was interesting to see it done like that and it was a time saver, at the same time is it fair? You spend all morning and afternoon getting the car set up to catch the car in front of you and slow you down. Then again a good driver will know how to get around the track. Well folks, qualifying is under way. We have 47 cars to qualify, look like due to cold track temps they are giving the drivers two full warm up laps, two green flag laps. I am personally looking forward to all the races tonight. So you guys will have to excuse me while I go enjoy this cold night at the track. Look for a post after the races!